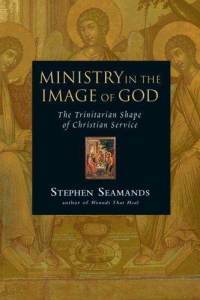 My friend Larry Hinkle recently recommended to me the book "Ministry in the Image of God, The Trinitarian Shape of Christian Service" by Stephen Seamands (IVP, 2005). I'm indebted to Larry for this recommendation - I am finding the book to be of great value in defining a Trinitarian view of mission that is grounded in a Trinitarian view of theology. Indeed, when it comes to the triune love and life of God, theology and missiology (as well as ecclesiology) are inseparable. As Seamands notes, the doctrine of the Trinity, though accepted by Christians, is often not the defining framework of our Christian ministries. He sees this as a mistake (and I agree!). For Seamands, authentic Christian ministry is (necessarily) trinitarian - it is our participation in "the ministry of Jesus Christ, the Son, to the Father, through the Holy Spirit, for the sake of the church and the world" (pp. 9-10). Seamands says that "I am convinced that no doctrine is, in fact, more relevant to our identity and calling as ministers than the Trinity" (p. 11). Seamands notes that the doctrine of the Trinity is "the grammar of the Christian faith" (p. 11), and it is therefore "crucial for Christian leaders to know the rules of trinitarian grammar" (p. 11). The purpose of that grammar is "not [only] comprehension or communication, but communion with God. It shapes our language about God to shape our heart so we might share in the... trinitarian circle of Father, Son and Holy Spirit..." (p. 12). He notes that "God goes the way of his trinitarian being..." and "our experience of God in salvation and our life together as the church in worship, fellowship and mission are [necessarily] trinitarian as well" (p. 15). He advocates that these characteristics become working principles as we learn to "think Trinity" in our ministry life and work.